Smartphones have become ubiquitous in the workplace. Most importantly, young employees now ask for better use of their devices and force HR departments to use mobile-optimized HR, which offers instant access (anywhere and anytime) to important HR information such as workshops and training programs, rewards packages, etc. Indeed, HR fraternity has seen several technological advancements in the past decade, but none more revolutionary than the cloud-based HR software. It is therefore not surprising when market reports predict the HR software market is expected to grow at a compound annual growth rate (CAGR) of 2.4% to reach $9.2 billion by 2020. Let’s explore here less known advantages of cloud-based HR software, which have made this technology favorite of all HR leaders. With the help of HR analytics tool, users can easily measure significant cost savings in all these workflows and subsequently measure ROI. According to Larry Ponemon, chairman of the Ponemon Institute, more than half of Fortune 1,000 firms experience an annual data breach of 1,000 to 100,000 confidential records, including those of employees. This stats show how critical data security is. That’s why all leading cloud-based HR software vendors are compliant with industry standards and regulations. Additionally, cloud-based HR software can secure your business and employee records by reducing the paperwork. Traditional HR software and IT setup were highly customized leading to high maintenance costs. With modern cloud-based systems you don’t need to worry about these challenges. After the huge surge in cloud-based services for recruiting, talent management and other HR applications; all leading cloud-based HR software vendors have started incorporating “Interoperability Standards” in their products. In cloud computing, “Interoperability” refers to the ability to move data and workflows from one cloud provider to another. A common practice of enabling interoperability is the use of open standards. However, there are many ongoing cloud standardization projects and international cloud standardization bodies are working on it. Metrics of employee engagement with the manager: With this data, you can measure working relationship of employees and their manager. This is a very critical statistic which may allow you to predict the productivity of a specific team. Metrics of employee engagement with the organization: With this data, HR leaders can understand employees’ opinion about the leadership and subsequently employees’ loyalty (~refer retention period) with the organization can be measured. HR policies and guidelines evolve with the growth of an organization and introduction of new compliance standards. With global and distributed organizations, managing these changing rules and communication can become extremely tedious and expensive. 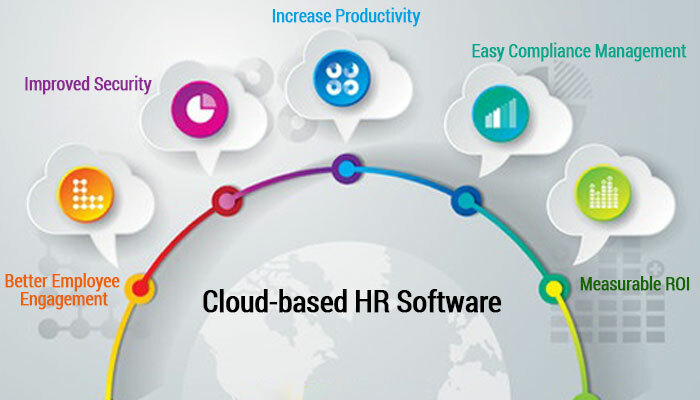 Cloud-based HR software systems offer an easy-to-use interface where you can list all key HR policies, guidelines and labor laws as also make them applicable to different types of employees based on their type of employment, geography and other demographic parameters. Cloud-based HR software systems are the new buzzword in the HR domain and is here to stay. As we have learnt that HR software market is set to grow rapidly (~refer 1st paragraph), this growth will be driven by Rising Role of HR in Strategic Activities and some selective HR practices, which include Talent Management, Training and Succession Planning.